US President Donald Trump’s former lawyer, Michael Cohen, has pleaded guilty in a New York court to violating campaign finance laws. He said he had done so at the direction of “the candidate”, for the “principal purpose of influencing [the] election”. The admission was related to hush money paid to Mr Trump’s alleged lovers. Clearly referring to Mr Trump, Cohen said he had been directed by “a candidate for federal office” to break federal election laws. 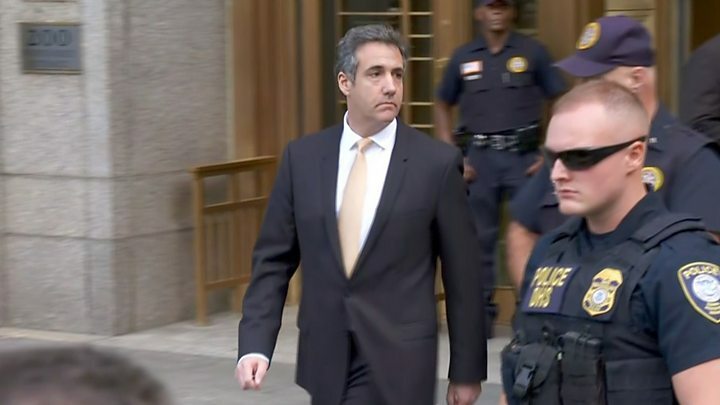 This was the legal summer blockbuster that journalists had been waiting months for and, in terms of courtroom drama and potential political impact, the appearance of Michael Cohen, Donald Trump’s one-time Mr Fix-it, didn’t disappoint. Though he did not mention his name – or those of the women in question – the candidate is, of course, his former boss, Mr Trump. He left court to chants of “lock him up” from a few of his fellow New Yorkers. Robert Khuzami, the deputy US attorney for the Southern District of New York, said Cohen’s crimes had been “particularly significant” because he was a trained lawyer. He said Cohen had provided “sham” invoices to the campaign for legal fees that he allegedly provided last year. The prosecutor also said Cohen had sought reimbursement for his “excessive campaign contribution” by submitting the bogus invoices to the campaign. The lawyer for Ms Daniels – who is suing both Mr Trump and Cohen for defamation – tweeted that the court developments had boosted her case against the president. How did Trump and Cohen’s lawyers react? Cohen’s lawyer said his client was living up to his vow in an interview last month to put his loyalty to family and country above his old boss. Cohen worked at the Trump Organization for more than a decade and continued to serve as Mr Trump’s personal lawyer and fixer after the election. The FBI seized a number of files in April from Cohen’s office and a hotel room used by him in New York. They had conducted the raid reportedly following a tip-off from Robert Mueller’s team. “If those payments were a crime for Michael Cohen, then why wouldn’t they be a crime for Donald Trump?” Cohen’s lawyer, Lanny Davis, asked after Tuesday’s proceedings. Rudy Giuliani, a lawyer for Mr Trump, told reporters that there had been “no allegation of any wrongdoing against the president” in the charges against Cohen. The chances of impeachment would increase dramatically were an ongoing investigation led by Robert Mueller to conclude that the Trump campaign had colluded with Russia to sway the 2016 election – a charge denied by Russia and described by Mr Trump as a “witch hunt”. Cohen’s lawyer said his client was keen to “tell truth to power” and that what he had to say was going to be of great interest to Mr Mueller. Speaking at a rally in West Virginia, Mr Trump said the Cohen and Manafort cases did not involve him and had “nothing to do with Russian collusion”.